Dave Assman is sticking it to the man by sticking it to the back his truck. Dave Assman is sticking it to the man by sticking it to the back of his truck. 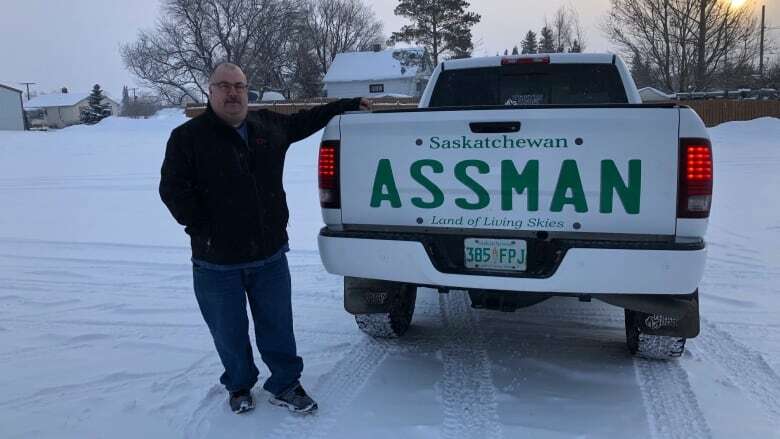 When Assman (pronounced "Oss-men") applied for a personalized licence plate, his request was denied. Saskatchewan Government Insurance, which manages vehicle registration, called the name an "unacceptable slogan." The Melville, Sask., man has since immortalized his last name on the back of his truck with a large decal that looks like a giant Saskatchewan licence plate. "It's just a name, and censorship should be out of the window," Assman said. He would still like the licence plate, but he is happy with the decal. Assman said the government seems to want to "cater" to those who may be offended by the name rather than give him the freedom to display his name. "It upsets me, but I'm not one of those guys to take offence to it," he said. Assman said he filed an appeal Tuesday of SGI's decision not to give him the licence plate and that SGI denied the appeal that same day. SGI responded to the whole situation on Twitter and kept it short and sweet. The Facebook post revealing the decal has been shared more than 3,000 times. Emily Pasiuk is a reporter and web writer for CBC Saskatchewan and an associate producer for The Morning Edition. She has also reported at CTV Saskatoon and written for Global Regina. Reach her at emily.pasiuk@cbc.ca.